The Gonzales Flag, also known as Come and Take It Flag was originally designed in 1835. The Gonzales flag is named after the Battle of Gonzales, during the Texas war of independence. Buy premium quality from Tuff Flags, our flags are made with precision and craftsmanship, printed on UV resistant Denier nylon with Dupont ink and finished with heading and 2 brass grommets used for hanging. Our flags are made to withstand the outdoor weather elements. Shop from our Commercial Grade, durable and 100% made in the USA Come and Take It Flags from us and get the advantage of the best prices, quick shipping, and much more! 100% customer satisfaction guaranteed! 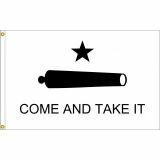 The "Come and Take It" flag features a cannon with a star above the phrase, as the battle itself was initiated when a Mexican official asked Texans to return a cannon they had lent to the colony of Gonzales to protect itself against raids by Comanche Indians. During the battle, when Mexican troops attempted to take back the cannon, the people of Gonzales successfully resisted the Mexican troops and created the handmade Gonzales flag to wave during the battle with the Mexicans, sending a message to “Come and Take It.” Our single face reverse Come and Take It Flags that are available in sizes 2’x3’ and 3’x5’ have reinforced flyends and UV resistant Dupont ink imprints, which will make it a perfect choice for the outdoors. Our flags are100% made in the USA.